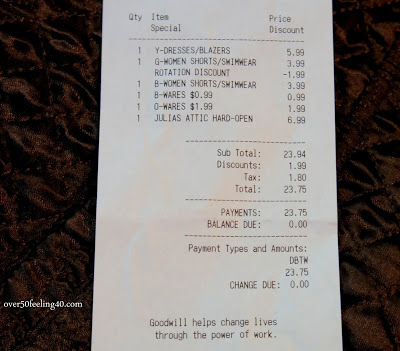 Goodwill: My Lifestyle Needs Under $25! Today is a Lifestyle Link up with JENNIFER and HEATHER!  Our personal style involves so much more than clothes…home decor, our families, our entertainment, cuisine…how we prefer to live. There are many components to our personal tastes and preferences…but we do not have to break the bank in order to live the way we desire. Our local GOODWILL SA locations are amazing. So, I decided to give myself a blogging challenge and go see how much I could purchase for $25 which met my own criteria for style. Here is my stash…now let me explain. My daughter and two grandsons have been staying with us for a couple of months. So, she asked I look for some shorts. Two pair of Calvin Klein shorts came home with me for her, one was $2.00 and one $3.99. 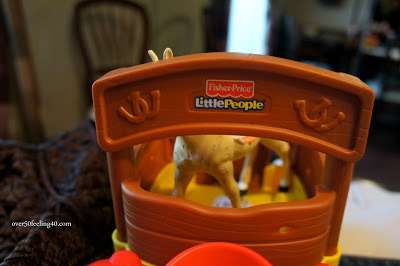 The toy-style of my 2 1/2 year old grandson is presently Little People toys…he loves them. So this tractor and horse was for him. After, a cleansing bath, the toys gave him some fun for $2.99. 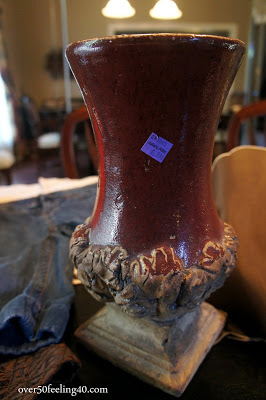 I immediately took this pottery vase! 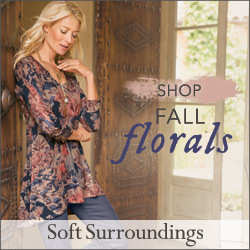 My home decor style is French Country and I recently began a change in the master bedroom. This looks perfect on the nightstand by our new bed! For only $6.99. 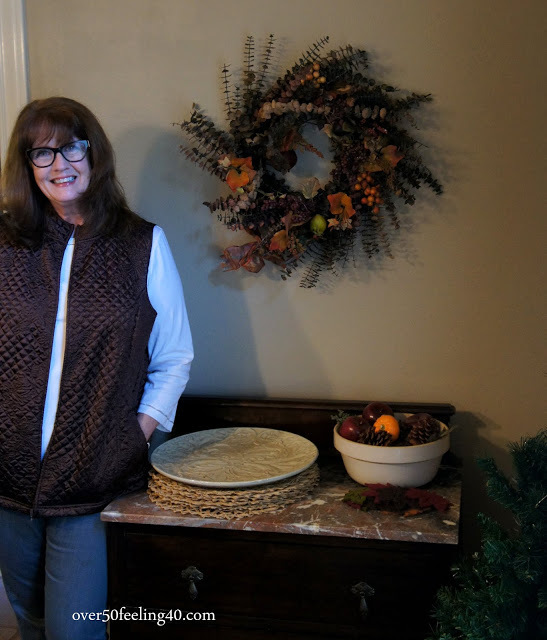 Finally, for only $5.99, straight from QVC to me at Goodwill, a new Susan Graver, quilted vest! My style…and for a song. Happy 70th Anniversary, Goodwill SA! Thank you for all you do for our community with jobs, job training, and to assist our veterans. 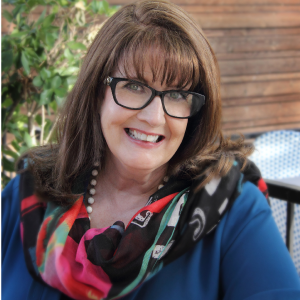 I am linking up today with the LIFESTYLE LINK UP…you should find some fun reading there. Disclaimer: Goodwill does compensate me for shopping these finds, but the words are my own. 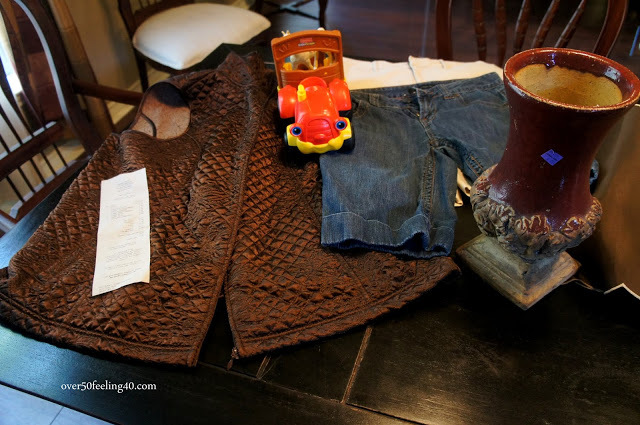 In San Antonio, these purchases were made at the Goodwill located at Highway 281S at Bitters Road. I am a GW junkie – love the place. There is no better place to shop for a perfect ugly Christmas Sweater Party! 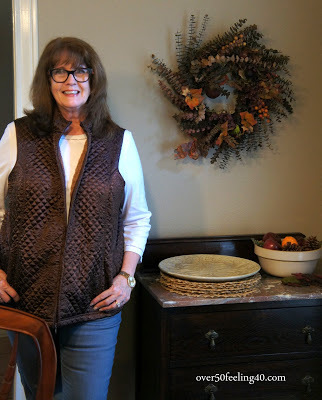 The vest is perfect on YOU!I adore GOODWILL TOO…………always find a TREASURE! I love the vest on you. I'm going to have Contessa where the good GW is around here! Thanks for joining us today on SYLEfocus! Wow Pam great shopping the vest alone would have been worth it!! Thank you for all of your inspiration, always! Great finds! Some days you can just hit the jackpot. Feels good to save when you can. I love a bargain – and you did really well with all of these! Nothing beats a successful hunt for treasures like these!